I'm going to confess - as many times as I've been camping, I've never seen a firelfy, let alone capture one in a sweet mason jar. However, I love the idea of them and the magic they must illicit in young children. And I do believe that all beautiful things are those that are wild & free. I created these fireflies as a royal icing transfer on Facebook live. Have you joined me for a live tutorial? They are fun and messy and full of real life - so if you have any desire to see a behind the scenes, be sure to like my page and keep an eye out for my live demos. Royal icing transfers are awesome! I sketch on the back of parchment and ice on the top. You could do accents, letters, and more. If you mess up, no big deal - it's not on the cookie yet! This is an excellent way to practice and try new things out. I do suggest making more than you need because they can be fragile. Once they are iced, let them dry for a couple hours. Store the leftovers in an air tight container - they last forever! These mason jars of fireflies are my favorite of the bunch I think! First you need to flood the mason jar with black icing and then carefully place your royal icing firefly transfers into the jar. While the black is still wet, quickly drop the yellow dot trails behind the firefly. The stars are larger drops of white, then drag a toothpick through it to create the look of a star. This ampersand is so easy and there are so many themes you could create with it. I purchased the cutter at Semi Sweet Mike. I iced the background in a neutral white, but you could leave it naked if you didn't want that much icing. What would you fill in? 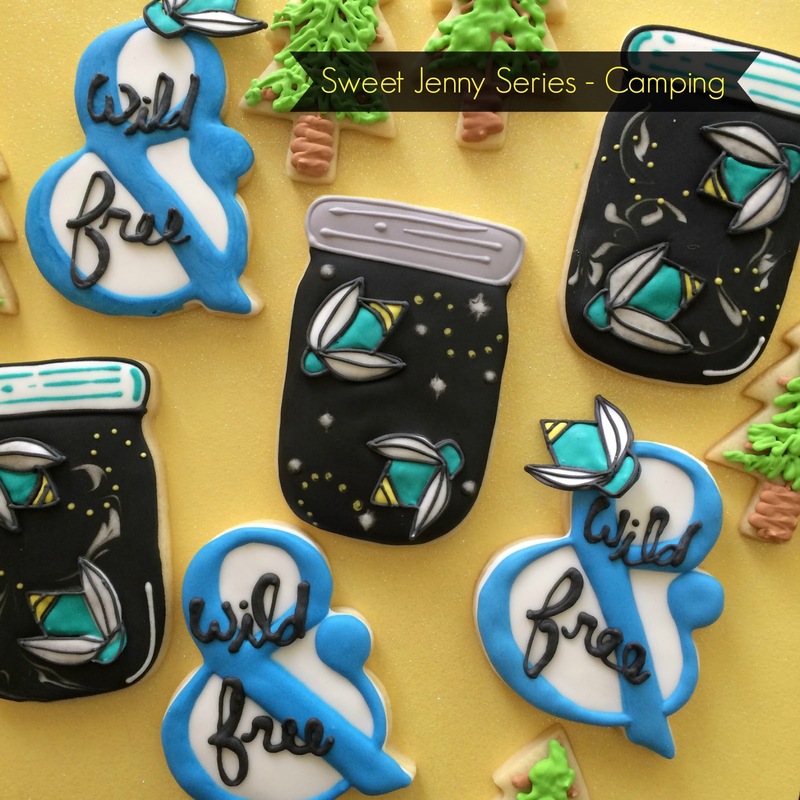 Have you seen the other camping cookies? Try out these fun camping lanterns or sweet glamping trailer! Do you need a good royal icing recipe? Try out my favorite here!